The fourth edition of the Independent art fair, among the plethora of shows popping up during Armory Week, is akin to the children’s tale of The Little Engine That Could, and in the end, it did. Compared to the Armory Show, which was like a trip to Ikea (one exhibitor in fact was selling furniture), and Volta, which dared to be different (I skipped Scope), the Independent was part art community, part church sale, and part paean to art team building that was sure to include nonprofit organizations like The Kitchen, Glasgow International Festival of Visual Art, Printed Matter, and White Columns. It was especially sensitive in dedicating itself to New York organization’s that were hardest hit by Hurricane Sandy, such as The Kitchen and Printed Matter, and not exactly embraced by FEMA compensations. Along those lines, the jurors for the show, which consisted of 49 international participants, made a clear and necessary statement: “It’s in the not-for-profits-from New York and elsewhere — where new ideas are tested and contested that contribute most to innovation in contemporary art and thinking.” Amen to that, a point well taken amongst all the frazzle, froth, and hoopla going on about town during the past week. The Kitchen participated with an all-star cast of performances stretched throughout the four days of the fair. Low-key atmosphere prevails at the Independent. However, on the down side, the Independent was so low key that for the most part, I couldn’t tell who the galleries were, or the gallery owners, much less the names of most of the artists. Wall labels were eschewed in favor of faint pencil scribbles, and the labels that existed were so discrete one had to hunt for them, an art-world trend seemingly popularized by the all-inclusive group shows of the Bruce High Quality Foundation, though Sideshow gallery’s annuals have been doing something similar for far longer. There was no one waiting in booths for clients, no hard sell, and the owners blended in with the patrons — a refreshing, if odd, departure from the other fairs. This forced you to look deeply and not rely on brand-name recognition of either an artist or a gallery to feel a body of work and become familiar with it. 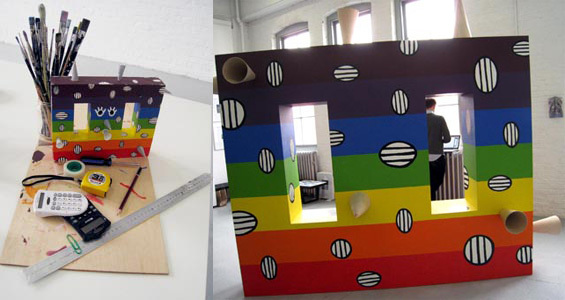 Left: Joanne Tatham and Tom O’Sullivan’s artists model on display; right: the life-size finished product. The exhibit that stood out the most consisted of haunting war photographs by An-My Le, at Murray Guy Gallery. I was delighted to find out that she had just won the 2012 MacArthur Fellowship for her depictions of military training. Her photographs tackle the dislocation she experienced as a Vietnamese child refugee in 1975 and her subsequent return to her homeland years later. These pictures blend in with battle reenactments and war training photographs of the experiences of current military recruits. 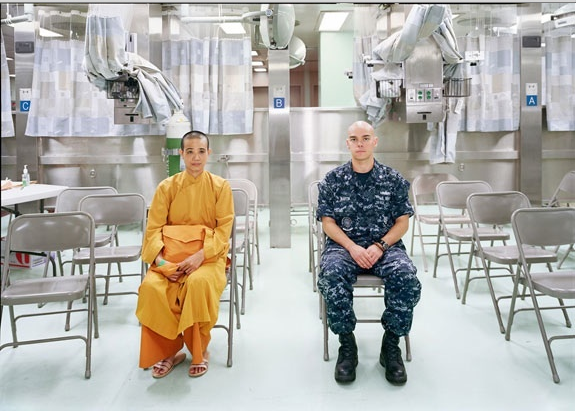 The most straightforward and haunting picture, “Patient Admission, US Naval Hospital Ship Mercy, Vietnam” depicts the patient, a Buddhist nun with a green hospital ID band, and her navy doctor with Buddhist prayer mala encircling his wrist. 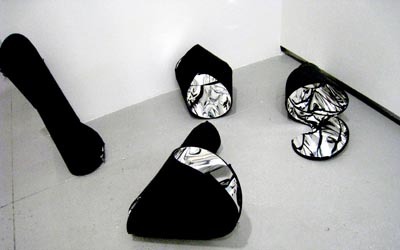 Both have shaved heads, and both are depicted in their “robes” in an otherwise sterile, steel environment. In contrast to that solemnity, I stumbled across the Suzanne Zander gallery, from Zurich, which was showing a hilarious, turn-of-the-century mediumistic photography series titled The Occult in Art: The Artist as a Medium, with various types of white goo or ectoplasm on the faces of trance victims. This is, after all, an art fair, not an art show, but the overall timidity of many galleries to avoid controversial topics in favor of sales was a sad reminder of who this market is really geared towards. This isn’t meant to disparage anyone, as artists and gallery owners need to pay their bills just like everyone else. 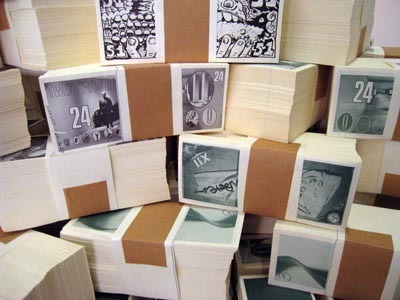 And if they can’t — well, just try picking up one artist’s depiction of stacks of art cash and taking that to the bank. 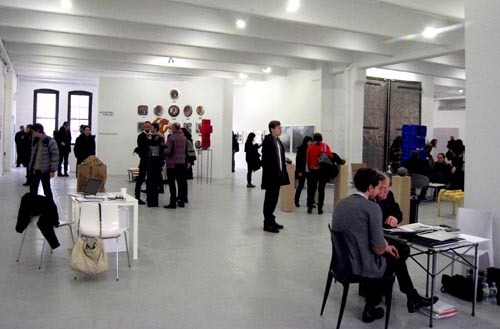 The Independent took place March 7–10 at 548 West 22nd Street (Chelsea, Manhattan).